The diagnosis and management of prostate cancer often presents difficult challenges. The dilemma of repeated negative TRUS biopsy or deciding to do expectant management for what may be insignificant cancer is faced in the clinic every day. Template-guided transperineal saturation biopsy can be an invaluable tool for diagnosis and cancer management. This new Saturation Biopsy Workstation and accessories are ideally suited for template-guided transperineal saturation biopsy procedures. 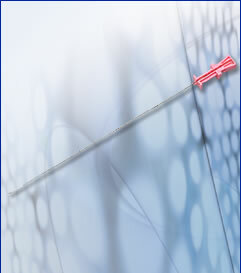 It allows the Urologist a means to saturate the prostate with biopsies using a systematic and reproducible technique of placemats and labels. The SeeDOS AccuCARE method organizes the prostate into 8 regions (octants) and further divides the gland into 26 sections. Each section is biopsied and catalogued based on its location in the prostate. All are readily accessible using the three reference planes commonly used in ultrasound. 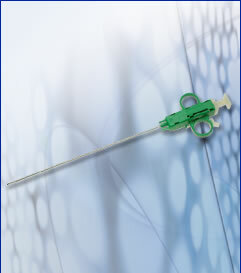 Disposable needle for FAST-GUN automatic reusable biopsy gun. Minimum order : 1 box 20, 25 and 30 pcs. 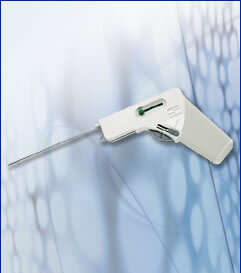 Fully automatic disposable gun for tru-cut biopsy. Minimum order : 1 box 20, 25 and 30 pcs. has a completely new super stable single arm fixation method with a single point locking mechanism and an adjustable weight assist feature which allows the user to achieve a weightless feel to the entire system. about the X,Y, and Z axes. The Micro-Touch LP (low profile) is specifically designed for use on cystoscopy tables with a fixed fluoroscopy/x-ray gantry. 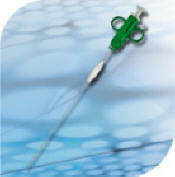 The Micro-Touch LP attaches to these tables on the side opposite the gantry and allows the user to do simultaneous fluoroscopy/x-ray and seed implantation while retaining all the best characteristics and the remarkable versatility of the Micro-Touch® ultrasound platform and needle guide system. 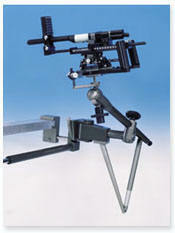 Lightweight freehand adjustment, micro-adjustment in every plane and about every axis and an ergonomic configuration allows the user complete freedom to move the patient under the fluoroscope and x-ray during the implant without the loss of position of the instruments or interference with the table. 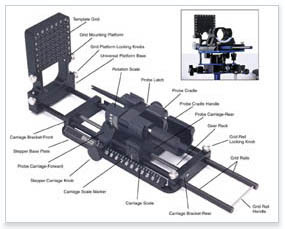 The Classic Stepper is a lightweight state-of-the-art precision stepping device. The stepper's modular design system is adaptable to a variety of ultrasound transducers.